I successfully learned the profile and things were working as advertised but I then had a problem with the flash and sent it back under warranty. When my replacement flash arrived the learned profile no longer worked. So I went through the learning process again, and it was successful. Even though the learning worked I am unable to change power output. For reference with the flash in manual without the V6 it looks like its firing at about 1/16 power. Any idea why it wouldn't work this time around with the same model flash? Why learning would be successful but not be able to change power? Any help would be appreciated, thank you in advance. Cactus say the Nikon version of the Yongnuo YN568EX II is not supported. While the statement is for the "II" version, I don't think that the plain YN5698EX is supported. I'm surprised to hear that you were able to create a flash profile for it since that would mean the flash supports analogue TTL (used for film cameras). Do you actually see the speedlight emit flashes with different power levels during profiling? I noticed that the latest firmware version for the V6 made changes to the profiling (making it slower). If you are using that and it has worked before for you, perhaps try to go back to an earlier firmware and see whether the profiling works again. That depends what Yongnuo did to your flash when they serviced it for you. Maybe they swapped a new firmware for you and made it no longer compatible fot profiling? Say it used to have an analogue TTL mode but after they serviced it, the flash only has digital TTL so you could no longer learn it using the Flash Learning Program. If it's now runs solely on digital TTL, try choosing Nikon SB-700's profile and see if it works on your YN-568EX. Thank you for your help the SB-700 profile works. I have control over the output. I do have another question, Ive seen your comments on other posts regarding the Nikon D750 and compatibility with the V6. Ive been looking at the D750 for my next body, what is it that is not compatible? I have 3 V6's currently if I were to get a D750 are there any options for making my existing V6's work or would I have to get one from Cactus thats been made to work with it? Again that you for your help with the YN problem. @aherr87 glad to hear it works! About the D750 hot shoe problem, I found an article on Peta Pixel with pictures, have a look. In short, it's out of spec - different from any other Nikon cameras. If you switched to the D750, the only option is for you to send your V6 units to us and we will swap the special hot shoe for you. More info here on returning your units. @Antonio, have you ever tried the solution suggested in the article, i.e., put something (cardboard or plastic) in the gap of the D750 hot-shoe? If that worked well then it would have the advantage of fixing the connection issues the D750 can have with other equipment, including some Nikon flashes. It definitely helps but not friendly to work with if we ask people to insert a piece of something when mounting their V6 on their D750. The current D750 special shoe is still compatible with most other camera systems but it's not perfect on the D750 as we wanted it to be as there will always be limitations if we want to go multi-brand. We are considering if we should take a step further and make a second generation of the special shoe, but this time a dedicate version just for the D750. This way we can take out any wiggle / contact issues. I'll keep you all posted if this really happens! Will the YN568EX II work with the Cactus V6 if I place it on the SB-700 profile, as you suggested with the YN568 model? I don't think the Nikon version of Yongnuo flashes are supported. Too bad we don't have it in the studio to test it for you. Anyone on the forum has one to try? @Antonio you mentioned on a different forum that the YN568EX will work with the SB-700 profile. That's the Mark I, and now you are asking about their Mark II version. By the way, why not consider the RF60 instead? on the RF60, charge 2 less AA batteries, and carry less in your bag. 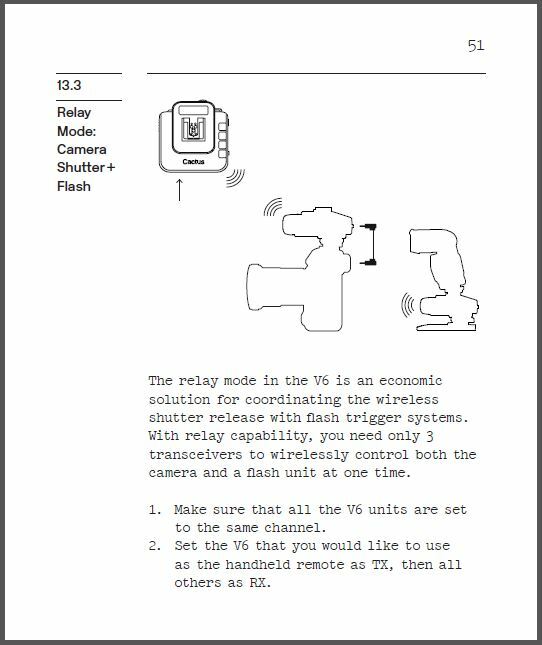 the Relay Mode of the V6. Antonio, I would buy the RF60 except that it doesn't have TTL capability. When you use this flash as an off-camera flash, there are no wireless TTL capabilities. Antonio, I'm looking for a flash that can do both. Usually during a wedding I have two flashes off camera triggered in power mode but I also have one on camera in TTL for a bit of fill. If the RF60 can do that I will buy two right away. Antonio, I'm looking for a flash that can do both. Antonio, note that some of the models in your list (e.g., the SB-24) are not i-TTL capable and hence Michel would not be able to use them for automatic on-camera fill-light purposes (or similar). In general, there are also those Nikon-compatible models which were confirmed to be compatible for profiling with the V6, i.e., it is possible to create a profile for them (through a simple procedure). However, again, some of those models may not support "i-TTL" but only "TTL" (which modern DSLRs cannot exploit anymore). Thanks Class A for the reminder. @MichelSauret please take note - choose a flash that has i-TTL.